The Division approaches capital work in a planned way. The long term, multi-year Strategic Facilities Plan completed in 2009 assessed all buildings and prioritized major capital projects exceeding $1 million in value for each based on building conditions, enrolment projections and programming needs. To make the work manageable, schools were placed into five-year groupings for renewal of all buildings over a 20-year period. This plan has formed the basis for our capital work over the past several years. We are currently working on refreshing our plan. The Division reviews the Strategic Facilities Plan annually and creates a Major Capital Request listing our top three priorities, which is approved by the Board and submitted to the Ministry of Education. The development of a new high school in the White City/Emerald Park area. The modernization and renewal of Greenall High School. The consolidation and modernization of the two existing Grenfell schools into a single, renewed school. As a result of anticipated student population growth along the Highway 1 corridor, a request was submitted to the Ministry of Education in 2007. 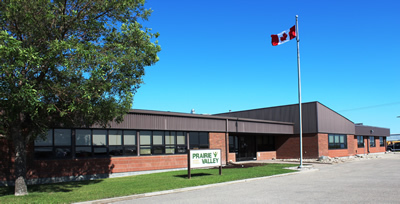 Prairie Valley was given approval to develop a stage one plan. Greenall High School right-sizing and modernization as well as a new high school south of Highway 1 in the White City/Emerald Park area are part of the report and plan. Click here to access the Highway 1 corridor information. The stage one plan was submitted to the Ministry of Education in early 2013. A study has been completed and submitted to the Ministry of Education analyzing the current state of facilities at Grenfell High Community School and Grenfell Elementary Community School. Click here to access the Stage One Submission - Grenfell Elementary Community School & Grenfell High Community School. The stage one plan was submitted to the Ministry of Education in early 2013. Health and Safety (site, foundation, floors/walls, utilization--one point is allocated for if over 140% utilization and two points are allocated if over 160% utilization). Efficiency (school consolidations, projected utilization three years out and a premium for reducing overall space usage). Building Condition (blended service life). Currently, the Ministry's Top 10 Major Capital Requests list does not include any Prairie Valley projects.